“A place for everything, and everything in its place.” Growing up, this was a phrase I heard more times than I cared to. My father, a career naval officer, spent years aboard ships, and liked his home to run on the same principles of discipline and order that worked so well when he was at sea. Though he met with varying degrees of success (and eye-rolling, and dramatic sighs) at home, I can say that in retrospect, he taught me a good foundation for starting a home of my own, even if ours isn’t quite as tidy. My own family has put down more roots. Because we don’t move every few months, it’s been much easier to accumulate, well, stuff, and much of it ends up in the vicinity of the hall closet. By virtue of location, usually near one of the home’s entrances, hall coat closets can quickly become the repository of practically everything a family hauls in and out. It’s no small wonder that many of them, including mine, tend to get a little out of hand. Rick Gumpert, owner of Closet Storage Organizers, has been helping clients get a handle on their closet clutter for 26 years. He says, “When I take an initial consultation with a client, the first thing I ask is, ‘What do YOU see as the problem?’” This thought process helps maximize the closet’s intended purpose. He says that most clients express concern about not having enough hanging space as well as not having adequate room for guests’ coats. But he believes that these issues need to be addressed separately. 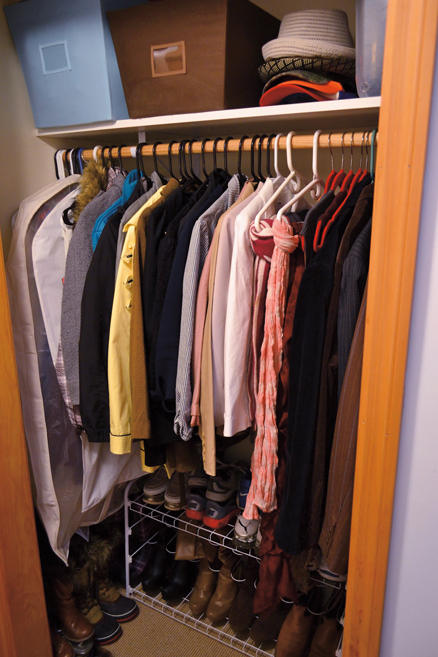 He says almost every closet can be improved with the use of double, “high-low” hanging rods to increase hanging space. But what about guests’ coats? Gumpert laughs, “We all know that if you are having a party, ALL the coats will wind up on your bed!” In all seriousness, however, he says that a good closet design will easily accommodate a couple of extra coats. Once you’ve decided that it’s time for a closet makeover, take a cue from Gumpert and decide what is your closet’s true purpose. Perhaps that means just coats, or likely, depending on space, you’ll want your coat closet to fulfill several storage roles. 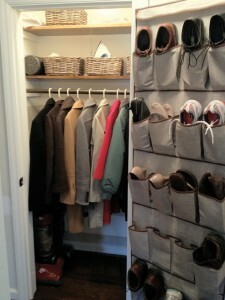 Make a list of each of the “jobs” you want your coat closet to fulfill. Coats? Sporting equipment? Cleaning supplies? Be realistic. 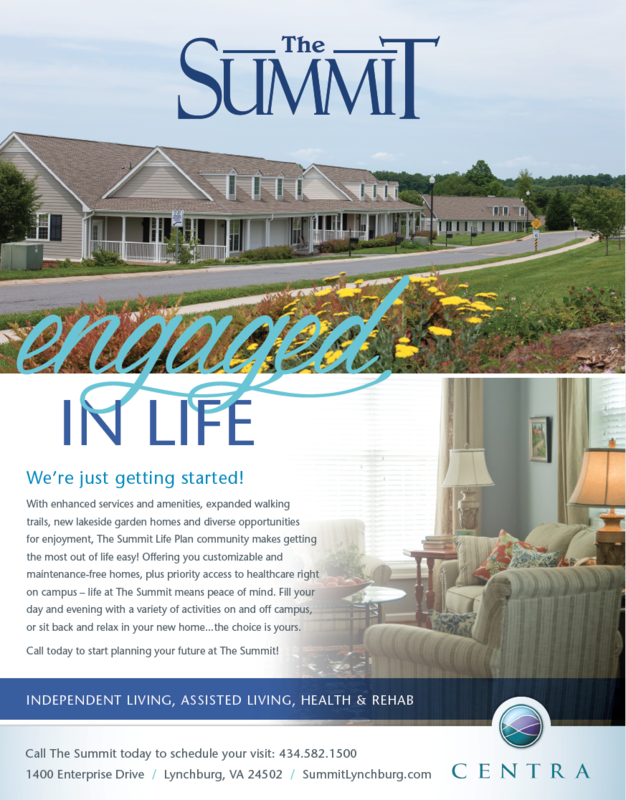 If it doesn’t all fit in there now, maybe some things will need to be relocated to other areas of your home. Experts recommend taking everything out of the closet initially so that you can properly measure the dimensions, and also give it a good cleaning. This is a great time to make any necessary repairs: oil the hinges, patch any dings in the walls, replace lighting, maybe even give it a fresh coat of paint. Consider painting the closet interior the same color as the paint on the walls of the room or hall where the closet is located, or even use a complementary or accent color. A new coat of paint provides a fresh, clean backdrop for closet contents. 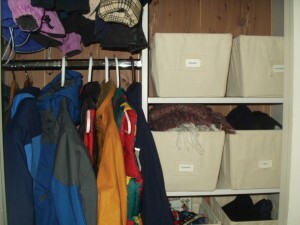 Once you have whittled down your closet contents, analyze what you have, and get rid of what you can. In times gone by, most adult coats were long, well below the knees, and older homes generally have coat closets designed to accommodate them with a single hanging bar at eye level. If you are lucky, there may be a shelf above this single bar, presumably for hats, which everyone used to wear every time they went out. But times have changed. Today’s coats—with the exception of a single dress coat perhaps—are generally shorter, and children’s coats of course are shorter still. Take advantage of shorter lengths by replacing the single eye-level pole with high-low poles that will maximize your hanging space: one pole hung approximately eye level, and the other about 30 inches lower. Voila! Twice the hanging space. 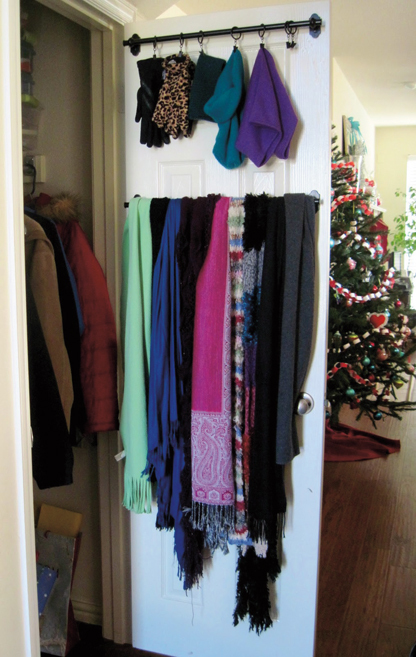 Hang adult coats, or those more frequently worn, on the upper pole, and children’s coats (or coats that get less frequent wear) on the lower pole. 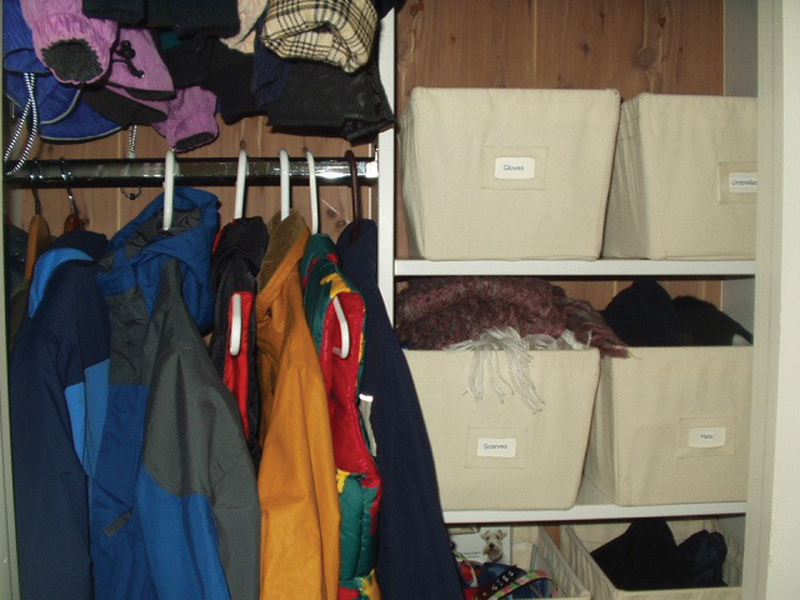 Unless you have a very large coat closet, plan to switch items in and out with the seasons, putting off-season gear in less-convenient storage elsewhere in your home. 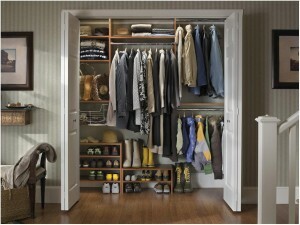 Analyze ways that you can make every inch of this premium closet real estate work for you. Over-the-door shoe holders make great storage for small items such as mittens, scarves, sunscreen or swim goggles. Large plastic tubs set underneath the hanging clothes can hold shoes and boots. Hooks or different-sized baskets can be attached to the back of the closet door, or even the inside walls if your closet is deep enough, to hold everything from school bags to car keys in an easy-to-see, easy-to-access way. If you have room, you may want to consider adding built-in shelves. Nowadays there are many options—basic shelving of wood or wire, attractive baskets, and shoe organizer pieces. 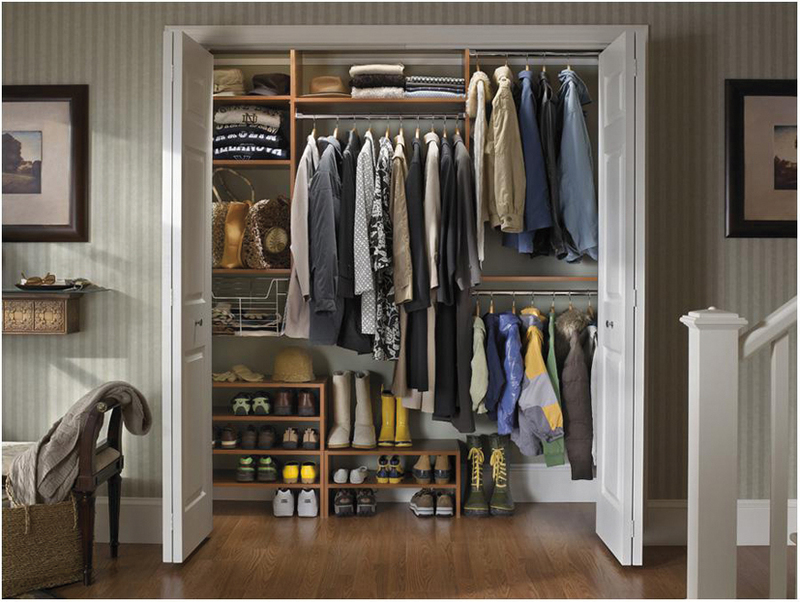 You can explore closet “systems” at local hardware stores, or opt for the professional help of a carpenter or closet designer who can design and build a system for your specific needs. 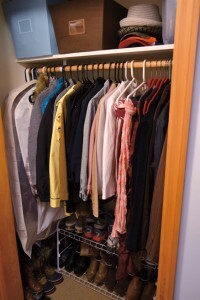 Once that closet is organized, keep it that way! This means running a swift mental checklist as you walk in the door, and putting things in the places you have designated right away. 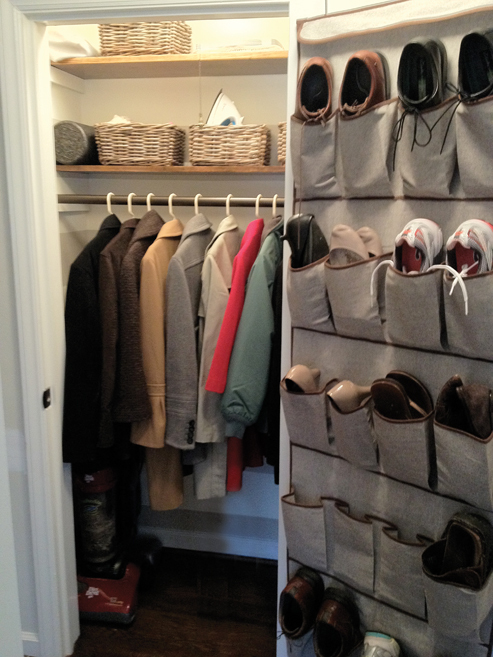 Hang up your coat and keys, send the lacrosse stick up to the player’s bedroom. Have a place for everything and put everything in its place. It turns out my father’s tight-ship method just may have been wise after all. Previous Post: What’s The Color Of The Year? : It Depends Who you Ask!